~Cathy~ Thank you so much from the bottom of my heart for this beautiful gift. And "Ditto", Kiddo. ~Cathy~: Thank you, for the beautiful gift, and for just being "You". That we would become very close and the best of friends without fail. Every word you write in your messages and mail always shows me your inner grace. And then before I know it, our time is up and you have to leave. Especially with each of us living on the other side of the sea. And before I know it the sun is up and shining in the sky. And as an angel in our pocket to each other he did send. And as very close and the best of friends we will always stay. I pray for the good Lord to watch over you as you turn out your lite. Knowing he is looking down and watching over you in his gracious style. The gifted and loving person within you shines through like the brightest evening star. Until that day, we can always share our lives, laughs and sorrows together here through rhyme. May your every day be filled with peace and happiness and may you smile and hum a tune. 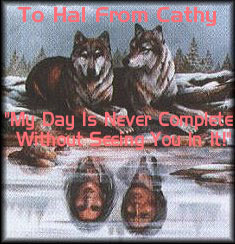 I promise to keep watch over her and to you Cathy, all my love in friendship I will always send. 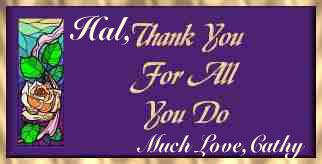 ~Cathy~ my good friend: "Ditto"
And thank you so much for this very beautiful gift. *The backgrounds, banners, dividers, graphics, animations, logo's, gifts, poetry and awards, on my Home page are copyrighted and or the property of "Chandos Wolf". Please do not take or use without my written permission. 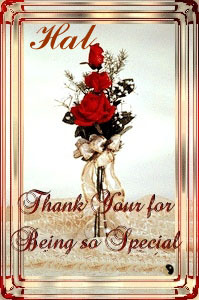 *I receive files containing pictures and graphics sent to me by friends and aquaintances, who surf the net. Should you find any graphics, pictures, or logo's which have been taken from your Home page and site without your permission, and used on my Home page and site, please contact me to either remove or link back to your site. I will honour your request. "Chandos Wolf".